For a team averaging 26 points a game, the Wood River High School girls’ basketball squad has to rely on intensity and desire to keep games close. 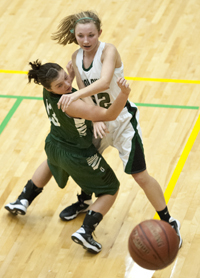 The Wolverines (4-3, 0-2 league) didn’t have much of either Tuesday night in a 53-22 Great Basin Conference home loss to the reigning league champion Burley Bobcats (5-3, 1-1) on the Hailey hardwoods. And it doesn’t get any easier today, Friday as last year’s GBC tournament runner-up Twin Falls arrives in Hailey for yet another league test. Twin Falls (5-2, 2-0) won at home 44-37 over Jerome (4-2, 1-1) on Wednesday, having beaten Burley 42-26 last Thursday on the Bobcats floor. Wednesday, Burley found its spots, shot 44% from the floor, out-rebounded Wood River 30-11 and showed it has resources left from last winter’s GBC title run that ended with a 40-39 overtime win over Twin Falls. It was Burley’s first league title since 2007. The Wolverines committed 15 turnovers in the first half and fell behind 28-9 at the break. Eight different Bobcats scored points in the first two quarters, and 10 Burley players ended up in the scoring column for the night. Leading Wood River (25% field goal shooting) were Ciceley Peavey (7 points, 2 assists) and Rory Cole (7 points, 5 rebounds, 2 blocked shots). Others were Blair Radford (2 points, 2 assists), Kenya Schott (3 rebounds, 2 steals), Michelle Mason (2-for-2 free throws), Haylee Pettit (2 points, 2 boards) and Manuela Cortina-Otero 2 points. Burley’s 5-8 senior wing Chelsee Baker (a game-high 11 points, 6 rebounds, 2 steals, 2 assists) and 5-8 senior Kaci Carpenter (6 points, 6 boards, 5 assists, 2 blocked shots) were the major factors as the Bobcats constantly found the open player cutting to the basket. Other Bobcat scorers were Mireya Villanueva (10 points), AnnGee Wayment (8 points, 2 rebounds), Bryn Bowers (6 points, 3 boards) and Kortney Hutchison (5 points, 4 rebounds, 2 steals, 2 assists). Meanwhile, the Minico Spartans (3-4) improved to 2-0 in conference play with a 62-35 road victory over Canyon Ridge (0-5, 0-2) in Twin Falls Wednesday. Wood River and Canyon Ridge will meet Jan. 7 in Twin Falls, after the Wolverines travel to Filer Dec. 17 and to Jerome Dec. 19.